A few years ago, during a summer recess at Moscow's Bauman University, two foreign students from Burma were abruptly expelled for drinking vodka in their dormitory. It was a minor infraction, one that would earn their Russian peers a reprimand at most. But these two students, like hundreds of others, were studying in Russia as part of their service in the Burmese military. They were part of a program to teach the Burmese government how to operate a nuclear reactor, how to find and process uranium, and how build missiles big enough to carry a nuclear bomb. Although they were thousands of miles from home, living in a run-down Moscow dormitory, they were subject to Burmese military discipline. That meant, they were headed back to Burma. The chore of taking them to the airport then fell to one of their professors, Valery Gostev, a lecturer in missile design, who recalls how their faces turned white as they sat in the departure lounge. "They were terrified of going home," he says. An aging engineer of the old Soviet school, who favors tweed blazers and orthopedic shoes, Gostev had never thought very hard until that day about the distant Asian government whose citizens he had been assigned to train. He started asking the students about their leaders, and they told him, warily, that Burma is run by a military junta. "I asked them, Why do you need these rockets?" he says. "And they told me, The same reason you keep dogs in your yard  to scare people off." For decades, that has been the main prerogative of Burma's government, which has been run by a clique of paranoid generals since 1962 until late 2010, when the country began a transition to civilian rule. The generals, however, still retain enormous influence. Their rule, which often mimics the regime in North Korea, has used their country's natural-resource wealth to build up a powerful army  purchasing weapons stockpiles and building a network of underground bunkers  while the population sank into abject poverty. The reactor sale was formalized in 2007 and, according to the contract, included training for "300-350 nuclear-energy specialists." It also stipulated that the reactor would be used not for military purposes but for scientific and medical research. But that explanation did not sit will with the world's nuclear watchdog, the International Atomic Energy Agency, or IAEA. As a portion of its economy, Burma spends more on its military and less on health care than almost any other country in the world, and the idea that it would splurge on a reactor worth $150 million just to make medical isotopes seemed ridiculous. A reactor that small "would represent no threat to world peace," Robert Kelley, a former director at the IAEA, wrote in an op-ed last month. "But without inspections, there would be constant concerns that even a small facility could be used for nefarious purposes." So far, however, Burma has refused to sign the nuclear agreements that would allow for IAEA inspections, even after evidence surfaced last year of a secret weapons program. 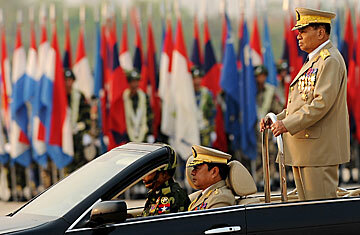 The source of that evidence was Sai Thein Win, a former major in the Burmese military. In 2010, he defected to the West with a cache of secret documents and photographs, which were published by the Democratic Voice of Burma, an opposition news agency based in Oslo. One of the documents appeared to be a military order for a "bomb reactor," while many of the photos showed Sai Thein Win posing with missile parts or with equipment that could be used to enrich uranium. He spoke to TIME by phone in October, but asked not to reveal his location. "If they know where I am, it would not be hard for them to have me taken out." By his estimate, around 10,000 Burmese students, mostly military officers, have studied at Russia's technical universities, and many of them were sent specifically as part of a nuclear program. He was among the first. In 2001, he says he became one of only three Ph.D. students accepted into Bauman's secretive rocket-engines department, where Gostev is a lecturer. "There was one guy from North Korea, one guy from Iran, and me," Sai Thein Win says. "The only guy who completed the degree in the end was the North Korean, so his rockets would be the ones flying tests over Japanese islands by now." Sai Thein Win's career was less prodigious. See photos of decades of dissent in Burma.